Here’s a holiday dessert for cheesecake lovers: Spiced Eggnog Cheesecake. The recipe is from Anne Callaghan, corporate chef of the Charlie Palmer Group in Las Vegas. 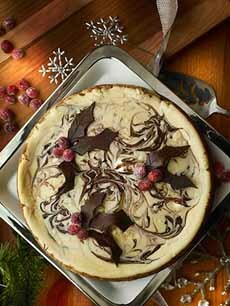 Spiced eggnog cheesecake with chocolate holly garnish (photo courtesy Charlie Palmer Holidays). A gingersnap crust adds to the holiday theme (photo courtesy Splendid Spoon). 1. MAKE the crust. 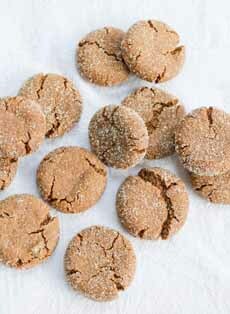 In a large bowl, combine the graham cracker crumbs, crushed gingersnaps, sugar and melted butter together. Press into bottom of 9-inch spring form pan. Bake in a 325°F oven for 10 minutes. Let cool on a rack before adding the filling. Increase the oven heat to 425°F. 2. MAKE the filling. In food processor or mixing bowl, beat together the cream cheese, sugar, whipping cream and flour until smooth. Add the eggs, rum, vanilla bean, nutmeg and cinnamon and continue beating until combined. Pour over the crust. 3. MAKE the swirls. Place small spoonfuls of melted chocolate dots equal distance around top of cake and one in the middle. Insert a toothpick into the middle of each chocolate dot and the filling underneath it, and make outward swirls towards the next dot. Continue until you have the majority of the cake covered in swirls. 5. BAKE the cheesecake in a 425°F oven for 10 minutes. Reduce the heat to 250°F and bake for 45 minutes longer or until the edge is set, but the center still jiggles a little. Turn off the oven and run a sharp knife around the edge of the cake; let it cool in the oven for 1 hour. Remove cheesecake to rack and let cool completely before garnishing. 6a. PREPARE the garnishes: Make the simple syrup by placing the sugar and water in small saucepan over medium heat; as mixture simmers, stir until combined. Pour the syrup over the cranberries and let cool to room temperature; then, place it in the refrigerator for ½ hour. 6b. REMOVE the cranberries from the syrup and shake off any excess syrup. Place the granulated sugar on a large flat plate and roll the individual cranberries in sugar until they are lightly dusted. Place the sugar-coated cranberries on a large plate, making sure that they do not touch. 7a. MAKE the chocolate holly: Melt semi-sweet chocolate over a double boiler and let cool slightly. Place the melted chocolate between two pieces of waxed paper, and roll out the chocolate until it is 1/8-inch thick. Place on baking sheet and refrigerate until firm. 7b. USING a sharp knife, cut out holly leaf shapes and use the back of the knife to make leaf details. Garnish the top of the cheesecake with several clusters of chocolate holly leaves and sugared cranberries.